The Diocese of Warangal was detached from the ecclesiastical territory of Hyderabad and was created by the Apostolic Constitution of Pius XII on December 22, 1952. Bp Alphonsus Beretta, PIME, was appointed the First Bishop of Warangal, transferring him from the See of Hyderabad. It comprised then of the civil districts of Warangal, Nalgonda, Khammam and Karimnagar. In 1977 the civil district of Nalgonda was separated and formed into a new Diocese of Nalgonda. In December 1985 Bp A. Beretta, PIME, retired. 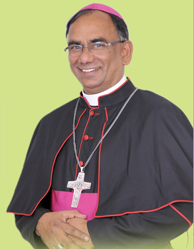 Msgr K. Joseph was the Administrator in 1986, Bp Thumma Bala has taken over the diocese as the second Bishop in March 1987. He hails from the same Diocese of Warangal. In 1988 the civil district of Khammam has been separated and formed into a new Diocese of Khammam. Now the Diocese is left with the civil districts of Warangal and Karimnagar.